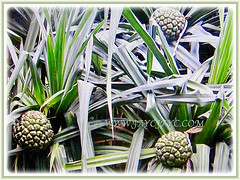 Tahitian Screwpine or Tourist Pineapple is a captivating and excellent plant for poor, salty or sandy soils in hot and windy areas. Being salt-tolerant, this versatile beauty helps to stabilize sandy soil along coastal and beach front properties where salt spray may kill most other plants. Botanical Name: Pandanus tectorius (Syn. 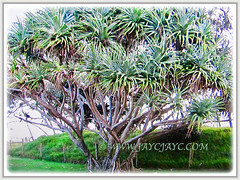 : Pandanus jonesii, Pandanus mei, Pandanus odoratissimus). 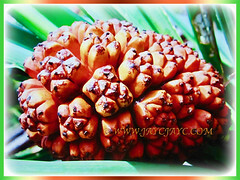 Common Names: Tahitian Screwpine, Thatch/Textile Screwpine, Tourist Pineapple, Hala, Screw Pine, Mengkuang Laut/Duri in Malay. 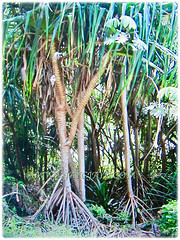 Etymology: The genus Pandanus is derived from the Malayan name pandang which refers to the screw pine. The specific epithet tectorius is a Latin word, meaning the roofs of houses in reference to it being used for roof thatching. The common name, Screw Pine comes from the spirally arranged leaves (screw-like spiral around stem) and its pineapple-like fruit which also resembles a large pine cone. Origin: Native to Polynesia, Micronesia, Melanesia and Australia. It is also cultivated elsewhere around the world. Plant type: An ornamental, perennial and tropical shrub or small tree. 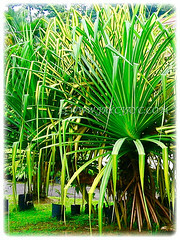 Features: Pandanus tectorius is from the genus, Pandanus which consists of about 750 accepted species. It’s a large, branching woody shrub or small tree that grows upright between 4-14 m tall. The single trunk is slender with brown ringed bark and covered with sharp conical thorns. It grows to 4.5-11 m in width and forks at a height of 4-8 m. It is supported by prop roots that firmly anchors the tree to the ground. Roots sometimes grow along the branch. The long and linear leaves are usually 90-150 cm long and 5-7 cm wide with numerous spines along the edges and the underside of the midrib. Dark green, sword-shaped and bent leaves are spirally arranged in clusters at the end of the branches. It is dioecious with very different male and female flowers that are borne on separate trees. The small, fragrant and short-lived male flowers are in dense and pendant clusters of about 30 cm long and surrounded by large and creamy white bracts. Female flowers are in rounded and pineapple-like greenish flower heads. 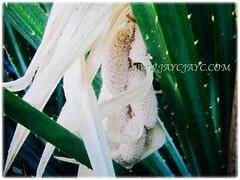 Female flowers are followed by rounded, also pineapple-like edible fruit heads composed of multiple wedge-shaped fruits. Fruits mature from green to yellow and then red, and are fragrant when ripe. Its fleshy and fibrous fruit is either ovoid, ellipsoid or globose, about 4-20 cm wide and 8-30 cm long. They are buoyant and the seeds within them can remain viable for many months while being transported by ocean currents. 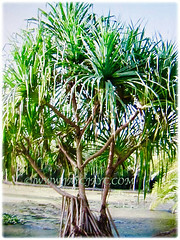 Culture (Care): Pandanus tectorius or Tahitian Screwpine grows easily with least maintenance. Light: Full sun or semi-shade. However, it will cease to flower or produce fruits in heavy shade. Moisture: Great deal of water, moderate water or minimum water requirements. Soil: Fertile, loamy and well-drained soils as well as poor and highly alkaline soils. It is also resistant to salt sprays and saline soils. Drought-tolerant once well established. Others: Remove yellow or brown leaves to keep the plants tidy and aesthetically pleasing. Old and decaying leaves should be cleaned occasionally out of the canopy as rats are known to nest in the debris. Feed once fortnightly or monthly with a balanced liquid foliage fertiliser for optimum plant growth and foliage variegation. Generally, free from serious pests or diseases though do watch out for mealybugs, aphids, mites and scale. 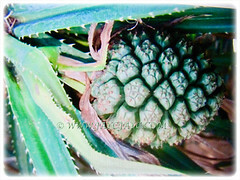 Pandanus tectorius or Tahitian Screwpine is intolerant of frost and must be grown in a frost-free environment. It can tolerate occasional temperatures down to almost freezing. It likes warm and humid conditions, growing in well-drained soils in full sun to part shade. In non-hardy regions with cooler climates, it may be grown in a large container that must be overwintered indoors from fall to spring. As a potted houseplant, locate it indoors in bright diffused light. Water regularly during the growing season in summer but reduce gradually during winter. Feed once fortnightly with a balanced foliage fertiliser from spring to summer but once monthly in winter. During winter, do not expose it to cold drafts or temps below 12.78°C. An excellent plant for poor, salty or sandy soils in hot and windy areas. Propagation: Easily propagated by seeds, rooted stem cuttings or root suckers. 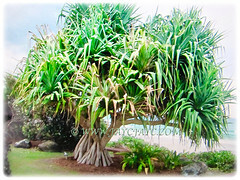 Usage: Pandanus tectorius or Tahitian Screwpine will be excellent in coastal regions, mangroves margins and beaches where they are naturally grown. Hence, an ideal plant for poor, salty or sandy soils in hot and windy areas. Being salt-tolerant, it’s great to stabilize sandy soil along coastal and beach front properties where salt spray may kill most other plants. Suited to be grown as a hedge plant. It is suitable for growing in large parks and gardens as well as along roadsides for its attractive foliage, orange fruits and fragrant flowers. 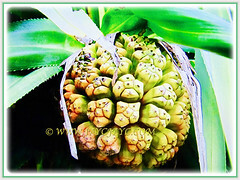 Fruits are a significant food source in Micronesia where they are eaten raw or cooked. The trunks are used to build houses, ladders, hard pillows, vases, fish traps, as firewood and is also a source of glue for canoes. Its leaves are woven into thatch for roofs, boat sails, mats, baskets, hats and a variety of other products. Besides, the young leaves are used to treat boils and other ailments in folklore medicine. The aerial roots yield a decoction that is used as a beverage in the treatment of blennorrhoea. This decoction, combined with urethral injections of the sap of the base of the banana plant, is said to be a rapid cure for this malady.